Gadang Clock Tower is so phenomenal since it was first built and became the main attraction in Bukittinggi since then. Until now, Gadang Clock Tower is used as the landmark of Bukittinggi and also as one of the icons of West Sumatra. Gadang Clock Tower was built in 1926 by an architect named Yazid Sutan Gigi Ameh. This clock is a gift from the Dutch Queen to Rook Maker, Controleur(City Secretary) of Bukittinggi in the reign of Netherlands East Indies. The laying the first stone was done by Rook Maker’s first son who was aged 6 years then. The ground-plan of Gadang Clock Tower is 13×4 meters while the height is 26 meters. This clock tower is moving mechanically and consists of four clock-faces facing four point directions with each face has a diameter of 80 cm. This clock tower has undergone several changes in its shape at the peak. At first the peak of this clock tower is round and there was a statue of a rooster on it. When Japanase colonized Indonesia, the government changed it to a pagoda-like shape. Finally after Indonesa’s decalaration of independence the shape was changed again into ornaments of Minangkabau traditional house. Development of Gadang Clock Tower is said to spend a total cost of about 3,000 Gulden, a fantastics amount of money for that time. But it paid off with the famous of Gadang Clock Tower as a landmark and icon or symbol of Bukittinggi. 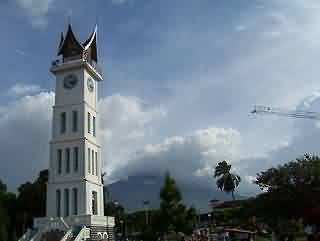 Gadang Clock Tower is also set as the zero point of Bukittinggi. There is one uniqueness from Roman figures written at the Clock. Instead of writing number four(4) as ‘IV’, it’s writting it as ‘IIII’.